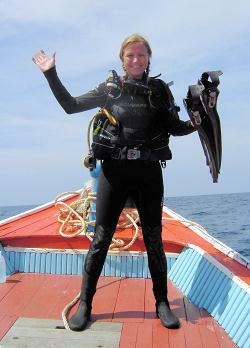 This is a woman whose gear we replaced very recently and who has just been back to Khao Lak. It was quite a journey for her in many ways so it was nice to be able to help make it a tiny bit easier. I am back! And as you can see I went diving in my lovely new equipment. I will write a little something for you in a couple of days when I have a bit more time. In the meantime I just wanted to say a HUGE THANK YOU to you and Diveaid. Without which I wouldn’t have had a chance to replace my equipment. Good hearts are sometimes hard to find, I feel privileged to know such a kind group of people.